Futball, Soccer, you've got the idea. Knight in the Area (Area no Kishi) has developed pretty much as I predicted in my taste test post; the original author, Tadashi Agi is far more interested in plot (event) than he is in characters or interpersonal dynamics. As a result this series can be quite exciting. For those who get most of their enjoyment from getting to know the characters in a show, this probably isn’t for you, because the characters are really character concepts that we never will dig into. However this show always manages to pull some crazy twist (event) out of nowhere, and so I find it a fun show to watch. I’ll explain what I mean about this being an event-focussed show after the jump. In a plot oriented series, the substance of the show is found in the events that occur. To get an idea of why I say this is a plot, or event, focussed show, consider the content of the show so far: We are introduced to some characters, but one of them dies (event) and his heart is transplanted into another person (event) who finds the diary (event) and decides to switch schools (event) to play soccer with the great player mentioned in the diary. 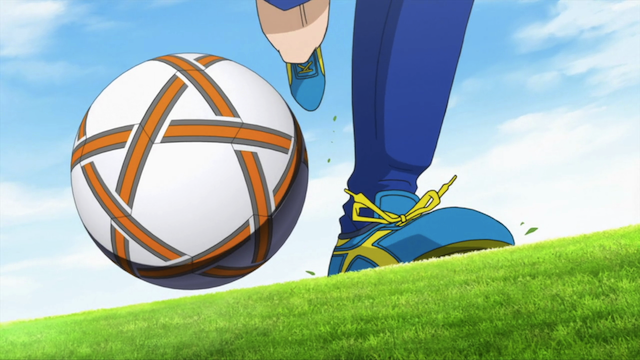 Now in a character-oriented show, the story would be about how the characters make big decisions like giving up on soccer or switching to a different school, instead the characters here are driven by the events themselves. You're gonna play soccer carrying around all that extra weight? 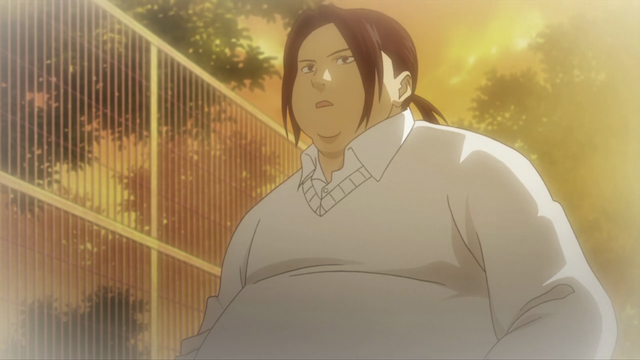 When the character shows up at the new school, he accidentally signs up (event) with the “Fun Club” instead of the soccer team that plays competitively, and the star player mentioned in the diary has gained a lot of weight and no longer plays soccer. The “Fun Club” plays a game against the regular team to decide who will get the right to play competitively (event). Out of nowhere one of the regular team’s members switches sides (event), but the “Fun Club” is still down two with only 20 minutes left to play. Suddenly the star player joins the team, and he has lost a lot of weight (event). In Soccer, this is the ultimate event. Again, we don’t see the overweight character struggling to take the extra pounds off. He appears unexpectedly and in great shape and that upsets everything, just as a random car accident completely upset everything early in the series. It is the event that drives the story forwards, and the characters are mostly vehicles for plot points — we don’t really ever get to understand what makes them tick. They aren’t complex and full of contradictions. They exist as props to make events happen. This may sound as if I am deriding the show, but really I am not. The show just needs to be enjoyed for what it is. Events aren't just adrenaline and screaming, though. Plotting can be thoughtful and complex, even if it plays out in the realm of events. Episode 7 had a very good example of how plot can be complex and thought-provoking, even if it restricts itself to the realm of events. 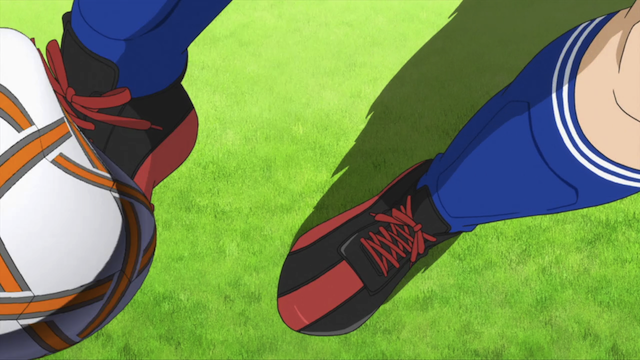 After the star player takes the field, he scores a goal, which gives the “Fun Club” hope of at least tying up the game. They are one point behind and the clock is running down, so the “Fun Club” needs to score; the event that needs to happen is obvious in a general sense. 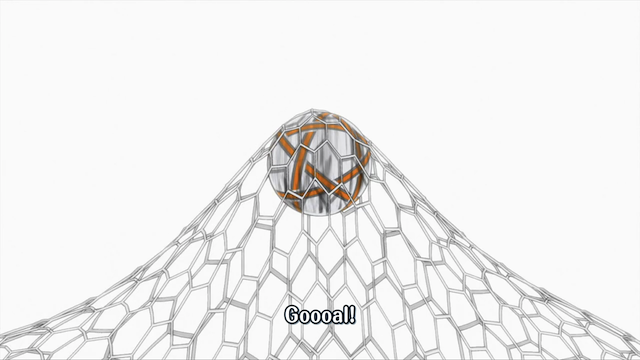 What follows is a series of failed attempts by the star player and the character with the transplanted heart to score a goal from further up the field, using long and mid-range shots. 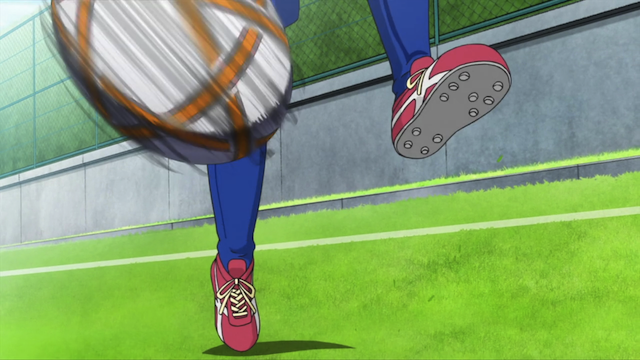 But these frustrated shots on goal are not just emotional toying with the show’s audience. These repeated (though unsuccessful) shots are actually a form of psychological warfare against the regular team, who respond by pushing their defensive forward while the goalie stays deep in the net. Thus a gap is created (event) into which a player can enter and get a solid shot, scoring the necessary goal. I personally find this kind of plot-based story very effective in a sports anime. I certainly find it more stimulating than “GAR! Me kick good.” Even though the characters are admittedly flat, I am confident that Tadashi Agi can continue to deliver these complex series of unexpected events. I guess I would say that Tadashi Agi’s writing can be detached and cool, in the sense that it doesn’t show an interest in penetrating into who the characters are deep down, or what makes them tick, but his use of events is clever, and he enjoys revealing unexpected things to the audience.